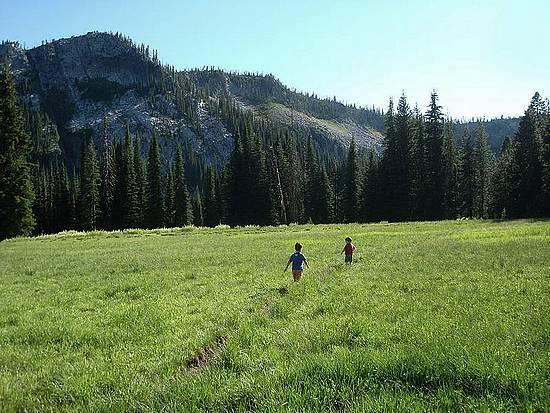 The Grassy Mountain Lakes (also called Grassy Twin Lakes) are nestled within the Grassy Mountains northwest of McCall Idaho. The trailhead is located about 25 miles from McCall, near the Hard Creek Guard Station. The lakes are a popular day hike destination, covering just over four miles round trip through wildflower covered hillsides and meadows. Its also a nice short overnight backpacking destination for young families. After a successful inaugural father-son backpacking trip last year, my wife let me take both boys (ages 3 & 5) along for the trip this year. We made the 3+ hour drive from Boise and hit the trail a little before 5pm. Most of the trail isn't very steep, but the steepest parts were near the beginning so we didn't go very fast at first, which was just fine since our 50lb pack on my back didn't have me overly motivated to set any land speed records. But the scenery was nice, and the wildflowers were abundant. Soon enough, the trail leveled out and we made our way through the grassy meadows near the lakes. We wandered to the upper lake, but didn't find any campsites to our liking, so we headed back down to the lower lake to make camp. It took us only and hour and a half to get there, not bad for short legs and a heavy pack for Daddy. After quesadillas for dinner, we did a little exploring before turning in for the night. The tent gave us some welcome relief from the mosquitoes. The next morning the boys played in the dirt while I packed up. Soon it was time to go, and none of us wanted to leave. But there were PB&J's back at the car waiting for us, so we hit the trail for some mostly downhill hiking. On the way back, we picked a nice bouquet of wildflowers for Mommy, which included Sego Lilies, her favorite. Map of our route, about 4.5 miles round trip. Hiking through Lupine and Aspen. A view of Bruin Mountain. Large meadow near the lake. Hiking through grass above the lower lake. Sitting in the sun to warm up. Walking next to the lake. Cliffs above the lower lake. Passing through wildflowers on the way back.